mundane jane: (Too) close to you. Have you ever fallen in love? If you're like most of us, when you fall in love, you want to spend every possible moment with the object of your affection. It's heavenly, that feeling. I like being in love. Eventually, though, you're going to want to go home--at least for a little while. There are things that need to be taken care of. The cat may be about to run out of food. Perhaps you can't poop any place but in your own bathroom. Nothing personal. That's just the way it is. Or suppose a fairly good friend just won cruise tickets and invited you to go along--her treat. You're pretty stoked. She's fun to hang out with, and the two of you get along fine. But if it turns out you're sharing the same cabin and very, very tiny bathroom for 7 days and 6 nights, that friendship might start to wear a little thin. Maybe by the time you're back on dry land, you're feeling as though you've just spent a very long week lost at sea with Tallulah Bankhead and Hume Cronyn, listening to everyone arguing about the Germans when what you most want to hear are the chimes of the Popsicle truck. My point? Togetherness is a good thing. Until it's not. 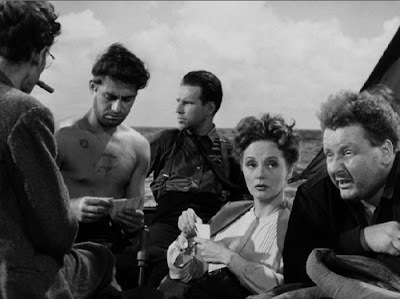 Image, Alfred Hitchcock's 1944 film, Lifeboat. The idea of sharing that tiny, tiny bathroom has almost convinced me I can't invite my daughter to share the cruise I want to take. Maybe I'll find some guy to go along. Oh my, that's even worse.